"I'm not just a token bunny." Walt Disney Animation's latest endeavour, directed by Byron Howard and Rich Moore (and co-director Jared Bush), is mostly a charming animated allegory for race relations and police brutality using talking animals and aimed at kids. Zootopia features popular, heartwarming themes of following your dreams, overcoming adversity, and cute animals to uncover not only a detective mystery, but also, teach lessons about judgmental attitudes. Ginnifer Goodwin voices Officer Judy Hopps, the city's first a rabbit police officer from Bunnyburrow, who struggles to change the minds of her neighbours and be taken seriously. 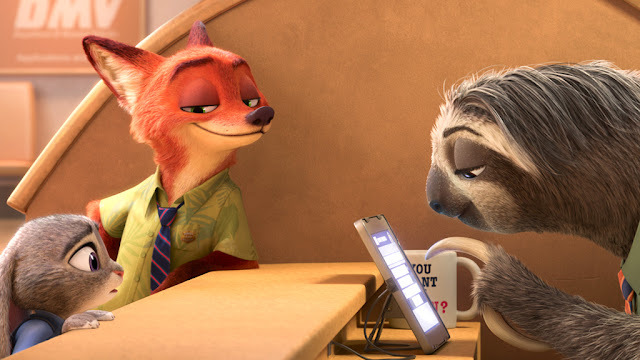 Jason Bateman as Nick Wilde, a red fox and small-time con artist, is a suitable buddy cop partner who adds fun to the dynamic pairing. Idris Elba as buffalo Police Chief Bogo is a fun addition just as J.K. Simmons as lion Mayor Leodore Lionheart and Jenny Slate as Dawn Bellwether, his sheep deputy mayor, round out the pleasing voice cast. While warm and very fun in its appealing nature, the film constantly presents itself as both a utopian metropolis ideal and problematic world divided by prey and predator wrapped in a city very reminiscent of the Disney theme parks it riffs off of. While constructed as a crime story in the mould of Chinatown, it is much more interested in our collective awareness of stereotypes and animalistic behaviour as well as human instinct to protect our own. Zootopia is admirable and fun but never threatens to break out further on the adult lessons of prejudice. It doesn't have the same emotional core as previous Disney animated films while it stretches the animal allegory to questionable lengths. It's a gorgeous looking, joyful cartoon that wears its appeal on its sleeve and themes on its shoulders but goes too far with the often problematic comparisons of racial tensions and animal instincts.